The force responsible for holding all nucleons together is the strong nuclear force. The strong nuclear interaction is the mechanism responsible for this force and the color force is the force (between quarks) that is responsible for this interaction. The exchange particle for the strong interaction is the gluon. The graph below shows how the strong nuclear force between nucleons varies as the separation of the nucleons increases. It also shows how the repulsion between two protons varies according to the electromagnetic force. At a nucleon separation of a femtometre - which is typical for nucleons within a nucleus - it is a very strong attractive force (104 N). 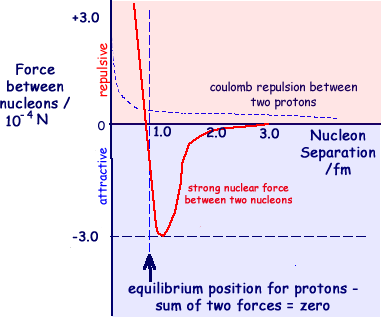 The equilibrium position - one with zero force acting - for nucleons in a nucleus is at a separation of about 0.5 fm (some sources say 0.7 fm - but AQA say about 0.5 fm). At much smaller separations between nucleons, the force is very powerfully repulsive. In other words nuclei are not easily squashed as the nucleons won't move closer together! A separaton of greater than 0.5 x 10-15m results in a smaller force of attraction - one that is virtually zero by about 3 femtometres. Thus, the strong nuclear force is a very short-range force. The line for the strong nuclear force cuts the distance axis at about 0.5 fm and approaches it very closely at about 3.0 fm. If asked to sketch this graph in an examination, make sure that you carefully label the axes and make the graph line approximately correct. When researching this topic I found some conflicting information! This was particularly so concerning equilibrium distances. I suggest that A level candidates quote the values given in the syllabus they are studying. The range of the nuclear force is such that a nucleon only affects those nucleons next to it. With a range of just under 3 fm and the diameter of a single nucleon being about 1.75 fm, only nearest neighbours within a nucleus can 'feel the force'. 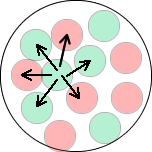 The diagram indicates the protons (red) and neutrons (green) affected by one of the neutrons in the diagram. This 'affecting neighbours' results in the nucleus being pulled into a sphere of attracting nucleons occupying a space of a couple of femtometres diameter. The more nucleons associated together the bigger the volume - but the average distance between nucleons is the same no matter what the size of the nucleus - nuclear density is roughly constant because of the action of the strong nuclear force. See nuclear density. Electromagnetic repulsion compared with the strong force of attraction. The much smaller repulsive electromagnetic force between protons has a much larger range and becomes the only significant force between protons when their separation exceeds about 2.5 x 10-15m.